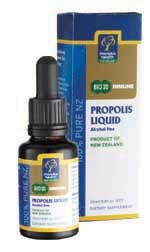 Propolis is gathered by bees from flowers in New Zealand's untouched pristine environment. Manuka Health's Propolis has very high BIOflavonoid levels that have been independently certified to be at least 30mg/g (BIO 30), BIOflavonoids can be helpful in maintaining a healthy immune system. Propolis is a natural immune-supporting substance gathered by honey bees from trees and used to protect the hive against infections. Bee Propolis Soft Gel contain propolis sourced from new Zealand's clean, green environment and Propolis Flavonoid Levels. The antioxidant effects of flavonoids have been shown to be beneficial in maintaining a healthy immune system. 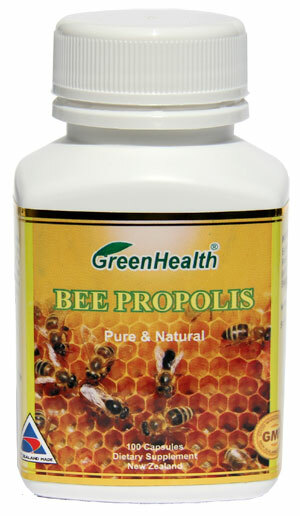 Bee Propolis Soft Gel are produced under strict GMP conditions to ensure the highest quality standards are maintained. Propolis (as extract equiv. to fresh 500mg). Natural Vitamin E 1mg. Bee's Wax, Lecithin, Vegetable oil. No artificial flavorings, preservatives, sugar, salt added. No artificial colourings with capsules. In past centuries the use of natural balsams such as propolis was common. Knights wounded in battle used balsams as a form of treatment. Over 100 years ago, an ointment made from goose grease and propolis was successfully used on horses and cattle to treat hoof fissures and sores, and an ointment of propolis and vaseline was used on human wounds during the Anglo-Boer war. Propolis has a very long history as a medicine for humans. It is reported to have treated colds and sore throats, stomach ulcers, burns, haemorrhoids and joint and muscle inflammation. Although propolis is considered by many as "folk medicine", its use has been revived. It is used by bees for repairing hive damage, sealing off strange objects from the cavity of the hive, partially closing the hive entrance in winter, and sealing down foreign objects which might find their way into the hive, such as sticks or small animals which have died or been killed by the bees. As they are too big to remove by bees, they are coated with propolis to "embalm" them and prevent their decay to reduce risk of infection.